Carl Howelsen caught the attention of Barnum & Bailey directors in the summer of 1906 while soaring 60 feet into a pool of water from a 90-meter tower at a Chicago amusement park. In November 1906 he joined the circus, which billed him as "Captain" and the "Flying Norseman". Howelsen was paid $200 a week to "ski sail" down a Vaseline greased 100 foot slide, which was set at a 45 degree angle, and land on a platform 75 feet away and into the arms of two strong men waiting to check his flight. Sometimes he jumped over two elephants placed between the slide and platform. Carl Howelsen founded the first Winter Sports Club team, was responsible for introducing Winter Carnival to Steamboat Springs, built our first ski jump, set jumping records, and was instrumental in introducing ski jumping and recreational skiing to Colorado. He is in both the National and Colorado Ski Hall of Fame and resided in Steamboat Springs from 1913 to 1921. The museum also owns an original poster, often on display in the Ski Town USA exhibit. 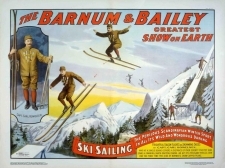 The Tread of Pioneers Museum has been granted permission by Ringling Bros.-Barnum & Bailey Combined Shows, Inc. to reproduce this 1907 full color "Captain Carl Howelsen Ski Sailing" poster. This full color giclee poster is available for sale in the Tread of Pioneers Museum store (locacted at 8th & Oak Streets in Steamboat Springs, 970-879-2214) in three sizes. You can also email cbannister@treadofpioneers.org to order. 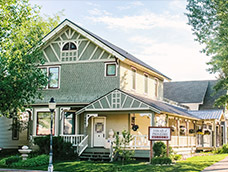 Your purchase supports the Tread of Pioneers Museum.